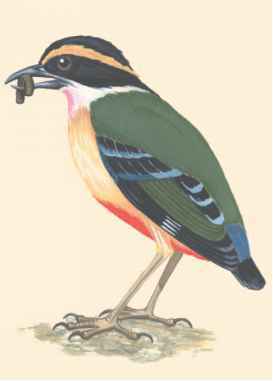 Physical characteristics: African pittas have a black head with a yellow side stripe; white throat with pink wash; blackish brown bill with a reddish base; deep buff breast and flanks (sides); whitish color under the bill and throat that turns yellow at breast; bright olive green upperparts with blue and black banding on wings; dark azure-blue rump; blackish flight feathers with paler tips; black tail with red underside and blue upperside; and pinkish to grayish white feet. Males and females look alike. Juveniles look similar to adults except they have duller colors. They are 6.7 to 8.7 inches (17 to 22 centimeters) long and weigh between 1.6 and 3.5 ounces (45 and 98 grams). Geographic range: African pittas are found scattered near the west-central coast of Africa including Sierra Leone, Ghana, Liberia, Nigeria, and Ivory Coast, and in central and southeastern parts of Africa including Tanzania, Malawi, Democratic Republic of the Congo, Cameron, Zambia, Zimbabwe, Rwanda, Burundi, Central African Republic, Uganda, and Kenya. Habitat: African pittas inhabit areas of dense undergrowth including evergreen bush country; thickets along waterways, swampy areas, and secondary forests; and tall semi-deciduous and evergreen rainforests. They are found from sea level to 4,100 feet (1,250 meters). Diet: Their food includes insects, insect larvae, ants, termites, beetles, slugs, grubs, snails, millipedes, caterpillars, and earthworms. The birds sit quietly and watch for prey. 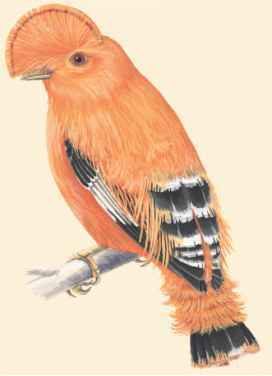 If none is found, they go to another perch or fly down to the ground to forage among the leaf-litter of the forest floor. Behavior and reproduction: African pittas are mostly terrestrial, often defending the territory by singing from the ground or a perch. They are found alone or in pairs during the breeding season. The birds hop quickly on the ground while foraging, and fly short distances when alarmed. Their main call is a "prrrrt" followed by a short, sharp "ouit" or "wheet." It is believed that they breed during the wet season. Their nest is a loosely made dome that is placed 7 to 26 feet (2 to 8 meters) off the ground usually in thorny vegetation. Nests are made of roots, sticks, twigs, dried leaves, rootlets, and fine fibers, with a side entrance and (sometimes) a platform made of dead leaves and twigs. Females lay one to four eggs, but usually three, which are dull creamy-white, sometimes greenish or pinkish, with reddish brown and purplish spots and lines over gray-lilac markings. African pittas and people: There are no known significance to humans. New Zealand wrens are very small, compact birds. They have straight or slightly upturned, slender, and pointed bills, which are about the same length as the head. Their wings are short and rounded. These birds have large, stout legs with strong, gripping feet and long, slender toes. The third and fourth toes are joined at their base. These birds have almost no tail. Their soft plumage, feathers, consists of greens, browns, and white. Adults are 3 to 4 inches (8 to 10 centimeters) long, with females substantially larger than males, although males are more brightly colored than females. New Zealand wrens are found on the North and South Islands, and some of the other surrounding islands of New Zealand. New Zealand wrens are found in forests, beech forests, scrublands, and alpine, high mountain, areas, especially when large amounts of insects are available. They are usually found from sea level to 1,150 feet (350 meters) in elevation. The diet of New Zealand wrens consists mostly of insects. They forage, search for food, alone, as a bonded male and female couple, or as a family group. They forage by crawling along the bark of trees and among the leafy parts of trees in phylum class subclass order monotypic order suborder family search of insects and small arthropods, invertebrate animals (animals without backbones) with jointed limbs. They sometimes forage on the ground.